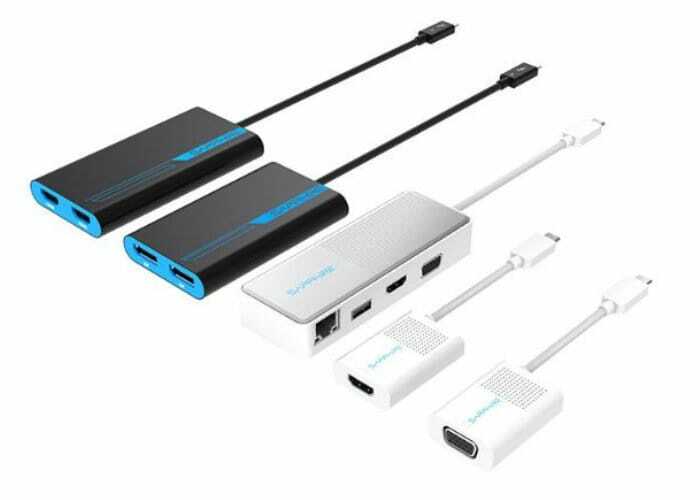 Sapphire has this week made available a new range of Thunderbolt 3 and USB-C adapters taking the form of the Sapphire Thunderbolt 3 to Dual HDMI Active priced at $109, the Sapphire Thunderbolt 3 to Dual DisplayPort Active priced at $119, USB-C 4-in-1 Travel Dock for $79 and the USB-C to HDMI and USB-C to VGA Power Delivery Charging adapters both priced at $39. Using the Sapphire USB-C 4-in-1 Travel Dock users can extend the connectivity options available from their Ultrabook with extra ports offering additional USB 3.0, HDMI 1.4 up to 3840 x 2160 @ 30 Hz, VGA 1920 x 1200 @ 60 Hz, RJ-45 Gigabit Ethernet and USB-C for up to 60 Watts of power delivery. All provided via a small pocket-sized adapter. While the USB-C to HDMI adapter supports resolutions up to 4096 x 2160 @ 60 Hz, while the VGA one offers 1920 x 1200 @ 60 Hz. Both adapters have a USB-C power input port that takes up to 60 Watts of power. For more information on all the new Sapphire adapters which work out of the box on a variety of different operating systems including Microsoft’s latest Windows 10, Apple macOS and Google’s Chrome OS jump over to the official Sapphire website by following the link below.